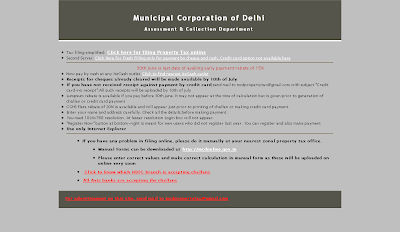 If you are an Indian and own a property in Delhi, then be reminded that in ideal circumstances one need to pay his/her/their Municipal Corporation Department's (MCD) PROPERTY TAX by June 30th of the respective calender year so as to avail an additional 15% rebate on the overall tax amount (but, if paid as lump sum amount, and not as part amount). The usual rebates (like that for properties owned by Senior Citizens, Women, Physically Challenged, Ex-Servicemen; DDA Residential; Village Abadi; Group Housing Flats, etc.) and the other exemptions (like for certain cases registered as Agricultural lands, Vacant Land or Building in Village abadi occupied for residential purpose, Lands exclusively used for public worship, Lands used for Public Charity, Lands used as burial/ cremation ground, Heritage lands and buildings, Lands owned by war widow / Gallantry Award winner being permanently used for self, and Lands and buildings of Corporation, etc.) can still be availed on case to case basis (if applicable) besides this 15% rebate on timely and lump sum payment before or after the deadline of June 30. Hope Bricks-n-Mortar.com's readers would be benefited in knowing what to do in case they need to file the MCD Property Tax. For any other clarification/information, please feel free to ask us via an email or through a comment on this blog post. Ask us in case you also have any query relating to civil engineering, architecture, building design & construction, interiors, etc. I must thank you people for helping me file my property tax online without standing in the long physical queues. I searched the internet on google, yahoo, etc. with MCD property tax has the key words. To my utter surprise and dismay, the results which were there on the top had the top line as "MCD property tax", but actually took me to such websites which had falsely made this as their tag line, and which told nothing about the real topic. I was about to hang up, when luckily I saw your weblink and clicked on it. Luckily, I landed on your website and followed the links and instructions you people had given, and filed my tax online without much hassles. My son asked me how I came to know all that without his help. I want to tell him now that its Team bricks-n-mortar which helped me. Thanks once again. And yes, I am reading your other articles too. They are good. We are glad we could be of some help to you, and others alike who have sent us 'thank you' emails. We are also glad that our purpose of putting up this blog for people's use has took off nicely. In case you need any other help or assistance, please do tell us. I submitted MCD property tax online by credit card, but I got no receipt. The last page showed an error message. What should I do now? Please help ASAP. Thanks in advance. The MCD's website is witnessing incredible traffic since these last few days as the last date for availing additional 15% discount for filing this year's tax is today, i.e., 30 June 2009. - Try to make sure you are surfing on a relatively high speed internet as slow speed internet connections tend to break the payment gateway transactions. - Do not try to complete the transaction in haste. Reload/ refresh the payment page only if the browser stops, or no fresh page gets updated, or if you get an error message saying the website is experiencing high traffic. > Check with your credit card account if the money has been debited on your card. > If your credit card is not charged, you have more to think and do. Wait for some time, and try to do the transaction again. Gosh, wonder when the government departments will become more user friendly / helpful!!! We are in process of checking out all our previous quarter's emails to look for pending queries, etc. Read your mail again during this process. Hopefully you could submit your property tax at last. Please do share your experience with us and our other readers so that prompt feedback be given to the concerned MCD officials. Thank you so very much sir for the nice compliments to our small, but dedicated team working following the principle of 'no profit- no loss' fundamental. We started this blog out of a hobby, and with a motto to utilize our knowledge and skills in service of common man in whatsoever means. When we hear feedback (positive/ negative/ neutral/ etc) from people like you, it makes us feel happy that we are successful in our motto to a certain extent. Your patronage to our blog is well-cherished and utmost desired, Sir. Hope you have subscribed to the updates of our blog (by email syndication or by RSS syndication, whichever mode you may like). In case you feel so, please also spread a word about our blog to your known ones also who could be interested in works similar to ours. Last but definitely not the least, we would certainly compile all the feedback received from our multitude of readers and subscribers to the concerned MCD officials so that they can better themselves in future. As for your payment status, the MCD's website might not be updated with all receipts (especially manual submissions). You must preseve the manual receipt obtained from the Axis bank branch for future reference and record as well. Not on line. I just went to a branch of Axis bank and paid by cheque. Meanwhile, though I have a receipt fro the bank, there is no indication on the MCD website that I have paid. I am searching for the self assessment property tax form F.Y.2010-11 to down load and submit it manually. I couldnot get it on net. I have taken a printed form of two pages( 4 page Both side) but annexures refered 'J' onward are not available. 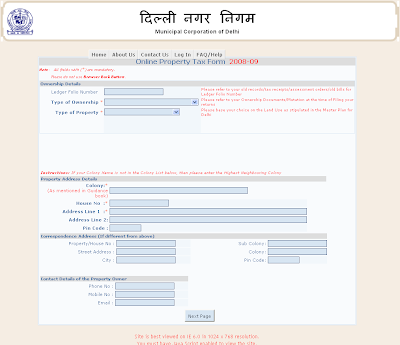 Can u send the complete form with all annexures. Unfortunately, the application uploaded by the MCD is a scanned PDF, which is not very clear. Yet, we have sent you the soft copy of the application form for your ready reference. We shall send you a better (clear) copy ASAP once we come across one. Please feel free in case you need any other info. Many of our readers using this post of our blog are lately reporting some of the weblinks presented in this post for ready reference are not working. Upon checking and following up with the MCD, it has been told that the MCD website is under updation as well as maintenance due to which certain links are either not working presently and/or are being modified by them. We would also keep track of the changes made by MCD, and would update the links as and when MCD makes them available. Your blog written very well! I believe I will have a lot of people like. Will also go to share of others.